The effect of material removal on workpiece dynamics has a great influence on suppressing resonance and regenerative vibrations in milling of thin-walled structures. Although some works have been done to obtain the varying dynamics of the workpiece, many researchers take plate structures as research objects. 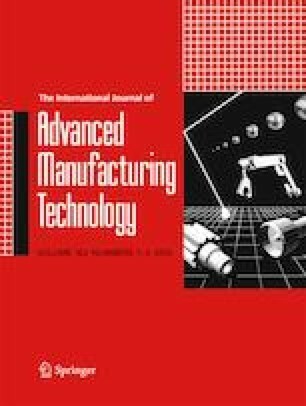 In this paper, a method based on FEM and Taylor series is proposed to predict the time-varying dynamics of thin-walled blade structures in milling. The input data in the method is the mass and stiffness matrices of the initial workpiece and the change of the matrices caused by material removal. The initial matrices can be obtained through the FEM model established by the mechanical analysis of the eight-node shell element, and the change of the matrices can be obtained by a third-order Taylor series. In comparison with three-dimensional cube elements, the shell elements can reduce the number of degrees of freedom of the FEM model by 74%, which leads to about 9 times faster computation of the characteristic equation. Meanwhile, the proposed method eliminates the necessities of re-building and re-meshing the FEM model at each cutting position, then the computational efficiency of workpiece dynamics is improved. Finally, the result of experiments shows that the maximum prediction error of the proposed method is about 4%. This work is supported by the National Natural Science Foundation of China (No. 51775444). In the above equations i = 1, 2,…, 8, when the value of i is not marked. Similarly, the third-order partial derivatives of the mass and stiffness matrices with respect to ti can be obtained.